This well established east end local is popular with Karaoke singers. Before this Japanese invention the pub was always known for it's singalongs. Frank Hassen one of Glasgow's best known pub musicians played the accordion here for years, he later went on to play the keyboards with his daughters Elaine and Ann singing. There has been a pub on this sit since at least 1826 run by spirit merchant John Monteith. In 1845 Scotsman Gregor McGregor was trading here for around thirty years. In October 1875 publican John Wilson took over the licence, he also ran a pub in East John Street. Mr Wilson employed a young man called James Battison Fraser, a friendship that would last for many years. Young James worked very hard in this pub and showed great management skills. Mr Wilson promoted James to Chargehand. This was great news for James as his wages were increased, a bar boy was getting 14/- shillings a week, the Friday and Saturday barman was getting 16/- shillings for the two days and James Was taking a £3.00 a week pay packet home. James B Fraser. Circa 1930. Mr Alexander Fraser standing outside the premises. James B Fraser worked for John Wilson for seventeen years, in 1925 Mr Wilson decided to retire due to ill health and sold the pub to James. His name then went above the door "James B Fraser". James sadly passed away three years later after taking over the pub. 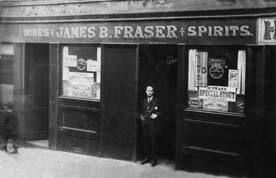 His widow Mary Cunningham Fraser then took over the running of the business with the help of her son Alexander, who became the licensee the following year. Alexander had sixteen years experience in the licensed trade. When Alexander passed away his wife Margaret Rodger Pritchard Fraser became licensee, at this time she was living at 261 Kennedy Street, Townhead. Margaret worked very hard here during the war times and sold the pub to James McCabe after the great war. The pub name was changed at this time to the Lovat Arms and was run by publican John McMahon in the 1950s and 60s. The pub was sold to Elizabeth Hurrel McPhail in 1962 and became well known as Betty's Bar. Other names this pub has had over the years is Winston's. Matt Fullerton the present owner enlarged the pub a few years ago taking in Pearson's shop next door, it is now twice the size it was when it was Betty's Bar. 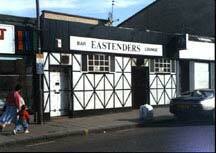 Eastenders was up for sale for £625,000 Freehold. September 2005. 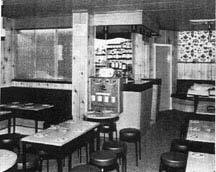 Interior view of Betty's Bar after alterations. 1967. Left to right Joe McBride, Celtic Football Club opened the renovated Betty's Bar in 1967, Daniel Hurrel, Mrs Hurrel and J Tresnan of Scottish Brewers. 1967. Eastenders is now closed down. 2008.